Kollu Rasam / Weight Loss Soup Recipe, today we will see how to prepare kollu rasam / horse gram soup which is very effective for weight loss. The recipe is shared with step by step photos. This is a south indian style soup preparation where kollu is pressure cooked with enough water. The cooked kollu is separated from water and used to prepare sundal or salad. The water is used to prepare rasam. This water is also known as ulavu chaaru. The water is loaded with all the nutritional benefits from kollu. Not only kollu but whatever pulse or legume you cook in water, the same water can be used to prepare curry or soup. So never waste that water. Soak tamarind and tomato in kollu chaaru and use it to prepare rasam. I have shared 5 kollu based recipes, Kollu Podi, Kollu Chutney, Kollu Sundal and Kollu Kurma Kuzhambu. If you try any of my recipes, then do share your feedback with us. 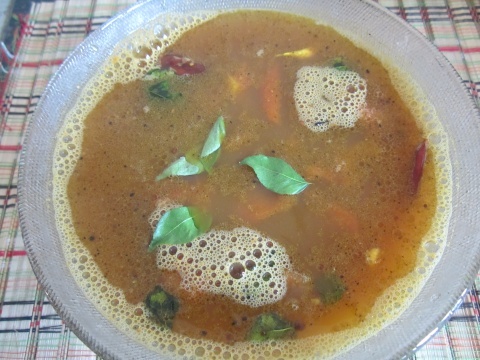 how to prepare kollu rasam / horse gram soup for weight loss with step by step photos. Pressure cook kollu with 4 cup water for 10 whistles. Remove from the heat and allow to cool. Take the kollu water separately and soak tamarind & tomato in that. Add 1 more cup water if needed. Keep the cooked kollu separately for preparing sundal. After 20 mins, mix squeeze tomato pulp and tamarind in kollu water using your fingers like we do to prepare rasam. Heat oil in kadhai and temper mustard seeds. Now, add curry leaves, broken dry red chillies, crushed garlic flakes, black pepper powder and cumin powder. Add the kollu water mixture, asofoetida and turmeric powder. Now, add salt to taste and chopped coriander leaves. Mix everything well. Once it starts boiling, remove immediately from the flame. Serve hot with steamed rice.